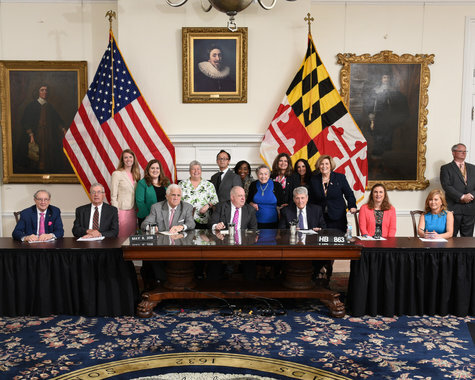 Our CRNA Modernization Bill HB863 was signed into law on Tuesday, May 8 by Governor Hogan in Annapolis. This achievement is due entirely to the hundreds of dedicated CRNAs who gave of their time and money to make this happen. We have removed the Written Collaborative Agreement. We have codified our Standards of Practice into law. We finally have an enabling statute for the practice of Nurse Anesthesia in Maryland. To Maryland CRNAs and the patients we serve!Thank you all for everything you have done. In short order, I will again be pestering you for donations and attendance at events. But for today, we celebrate! I’d like to thank in particular our lobbyist Bill Kress who worked tirelessly to champion our cause. To Delegate Bonnie Cullison and Senator Joan Carter Conway for sponsoring our bill. To the Government Relations Committee chaired by Michelle Duell with Chris Robel, Kathe Nugent, Mary Scott Herring, and Jacqueline Mitchell. Our Executive Director Becca Stinner. Sloane Whelan from KOFA Public Affairs. To the CRNAs who testified on our panels including Matt Zinder and Chris Romanowski. To the MANA Executive Board, Veronica Amos, Kelly Nevins Petz, Sheeba Paranilam, Johnny Gayden, Danielle Boggio, Joanie Campsie, Augustine Emmanuel, Andy Benson, Michelle Gonzalez, Karissa Hansen and Natasha Hopkins. To the MANA PAC, Kara Douglas and Sarah Parolski. To Shirley Devaris at the Maryland Board of Nursing. To all of our allies in professional and patient interest groups. And especially to all of you. You wrote letters, sent emails, made phone calls, donated to legislators and the PAC, attended events and supported the future of Nurse Anesthesia practice in Maryland. Click here for additional information on HB863.